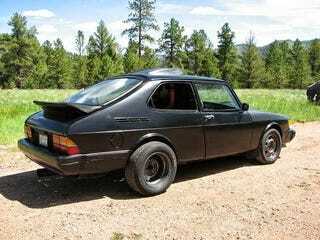 Stumbled upon this while looking up Saab parts, and immediately got distracted trying to find out more about it. The closer you look, the more crazy and awesome it gets. The Craigslist ad is long gone, but a little more digging revealed a five year old Oppo post, with a saved version of the ad. Maybe some of you remember it (it was before my time on Kinja). Now the ad doesn’t actually say “Saaxster”, so maybe that’s not it’s official name after all. But hey I’m down with it. The first things you might notice in that first image are the oversized rear tires and the roof scoop, neither of which make sense on a classic front-engine, FWD 900. But this is no ordinary 900. Holy crap, the engine is in the rear! (Technically mid-engined, as the bulk of the engine is ahead of the rear axle centerline.) Look at how accessible those belts are now! That’s the intake tube coming down from the roof scoop (hopefully with some sort of filter box), along with the intercooler. And yes, that’s definitely the intercooler- the radiator is mounted at the very rear. There’s no AC, and no power steering (unless there’s an electric unit up front). But why is there a steering rack back here at all? There’s nothing connected to its pinion. Maybe it’s there just to help locate the rear spindles, and is welded or otherwise locked into position. It’s an automatic, which I’m sure must have made things easier for the “master Saab mechanic” mentioned in the ad to rig up. A manual would have been tricky indeed. The original ad notes that the fuel cell has been placed up front where the engine once was, and claims that this is “one of only 2 know [sic] in the US”. Looks like a blast.